Bakaliaros (cod), in Greek “μπακαλιάρος”, is the traditional food we eat in Greece on the 25th of March, which is made with salted cod, fried in a beer batter. This is another Greek traditional dish which has become synonymous to the 25th of March, which is the Annunciation of Virgin Mary and on that day we also celebrate the Revolution against the Turks in 1821. The Annunciation in Greek is called Evangelismos and those named Evangelos or Evangelia celebrate their name day. My daughter has been christened Evangelia and we call her Elia for short and it is her name day as well. In Greece we celebrate our name days almost the same way we celebrate our birthday. However how did we come to prepare this dish? The 25th of March is always in the period of the Great Lent when the Orthodox fast for nearly fifty days. No meat, no fish, no dairy products and sometimes no olive oil are allowed to be consumed. The church made two exceptions: one is on the 25th of March and the other on Palm Sunday when only fish can be consumed. For people living near the shores they ate fresh fish on both these occasions but people in remote, mountain villages could not, as there were no refrigeration trucks to transport fish. So when salted Vakalaos or Bakaliaros (Cod) was imported, lots of years ago, it was ideal, not only for lent but for other days as well, as it was cheap and could be preserved for a long time. Try Bakaliaros coated with beer batter and then fried and you will have the most crispy and delicious cod ever that you won’t be able to resist devouring more and more bites.! ⇒ The basic secret for the batter is ice cold water and/or beer which help so that the fried pieces of fish do not absorb so much oil which would lead to “sticky” results. ⇒ Corn flour (starch) produces a crispy and light crust. ⇒ The egg white whisked into a meringue makes the batter light and fluffy. However, if you are fasting you can replace the egg white with baking powder. ⇒ The frying oil can be any kind of oil but I personally prefer olive oil, since it has a very high smoke point, so that it doesn’t burn even at high cooking temperatures, and it retains all of its health properties and brings out the true flavors of the food. ⇒ Hot olive oil does not penetrate food during the cooking process, as some other types of oils, which results in a lower fat content in the finished dish. ⇒ Fried food in virgin olive oil will not be heavy or aggressive to the stomach. Cut the cod into portions, remove skin (optional), rinse to remove salt and place in a bowl and cover with water. If cod is not a fillet make sure to remove all the bones. Drain and change the water every 3 – 4 hours for at least 24 hours before preparing. 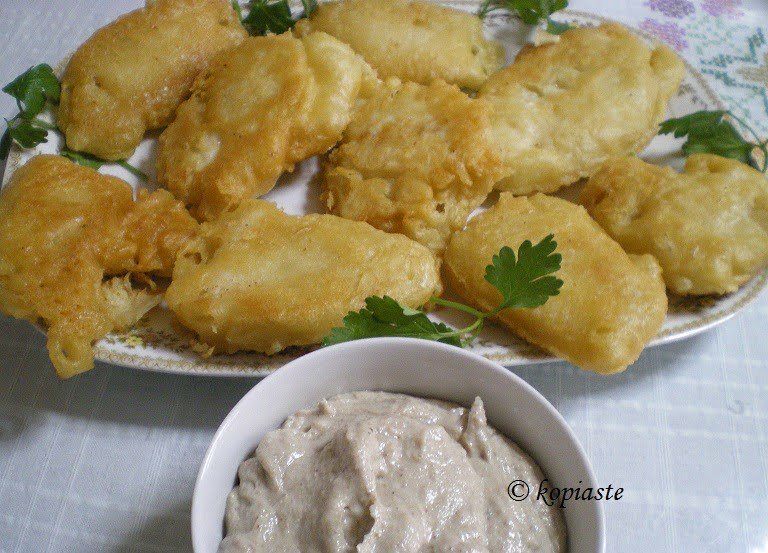 Bakaliaros (cod), in Greek "μπακαλιάρος", is the traditional food we eat in Greece on the 25th of March, which is made with salted cod, fried in a beer batter. Cut the cod into portions, remove skin (optional) and place in a bowl and cover with water. If cod is not a fillet make sure to remove all the bones. Drain and change water every 3 – 4 hours for at least 24 hours before cooking. Drain the cod and squeeze out any excess water. Beat one egg white into meringue. In a bowl add the flour, corn flour, (baking powder instead of egg white), salt and pepper, fennel fronds, the beer, the olive oil and lemon juice and start mixing adding the water gradually, until you have a thick batter. Do not add all the water as you may not need all of it. Mix in the egg white and place the batter in the refrigerator for an hour. Dip the cod into the batter and fry on both sides in hot olive oil. Serve with Skordalia (garlic dip). I love to learn about your tradition Ivy! It’s very interesting and deliciously appetizing! Olive oil, fish, kiwi sauce, strawberry sauce…there’s always sun in your cooking style! Thank you very much Herve. Val, you know that you are always welcome. This sounds wonderful and I will definitely make this! I wonder what you eat during Lent with such restrictions? I had a cookbook years ago with recipes from Northern Greece that had a whole chapter on Lenten recipes…sadly it has gone missing(I may have given it to someone??). Would be interested to know your family favorites. Many thanks for your wonderful recipes! Hi Kelly, Thanks for visiting. I have seen you around some friends blogs and I will definitely visit yours. Unfortunately only a few and mostly elderly people fast during the entire period of lent, including myself. We usually fast for a couple of weeks. However, you can eat anything a vegetarian eats. About my family favourites, this is one of the problems we do not fast the entire period because two of my three children do not like vegetables or dried legumes so it’s very difficult to cook during those days. Hola Ivy! I love cod in all ways! We have this same tradition here… cod was the meal for these days! But I don’t follow the tradition now as my parents did when we were kids. Anyway I enjoy cod and liked your recipe! Thanks! Couldn’t see the pics, though. Hi Nuria, glad to have you back again. I checked the pictures and I can see all of them. I really don’t know why this problem occurs. If others can’t see them as well please tell me. Pixie, I hope you can see the pictures. I love fish and chips (this is a bit different though) and do you believe there is no fish and chips shop in Greece. Bravo ivy! I’m so excited you made this as I just had this at my aunty’s house today! I love the way you explain the history behind the “yiortes” and the fasting. Thanks Peter for telling me about the photos. I have put them in again and I hope they can be seen now. I didn’t have this food for a very long time. It was delicious and I enjoyed it… Even skordalia was delicious with the garlic flavour to be balanced, unlike the skordalia we buy sometimes in restaurants…. Well done! Love the history & story behind every dish that you post Ivy…makes such good reading. This batter fried fish sounds ever so good…love the fact that it doesn’t absorb extra oil!! Yummy bella!! I am glad that you take the time to read them because I think most of us are busy and there are many sites to visit. Of course there is a Original fish and chips in Greece. OCEAN fish&chips in Thessaloniki Greece. Try them one of the bests with English and Australian traditional fish and chips. Thank you Petros for letting us know. It was a mistake on my part to write "in Greece" as actually I meant in Athens, where I live. I’m so excited you made this as I just had this at my aunty’s house today! I love the way you explain the history behind the «yiortes» and the fasting.